Fairgrieve Principal Jean Ciesla, top left, stands proudly with recipients of the Principal’s Award for having shown respect, responsibility, safety and problem solving skills throughout the first 10 weeks of school. Principal Jean Ciesla said award recipients serve as role models in their classroom and throughout the school. 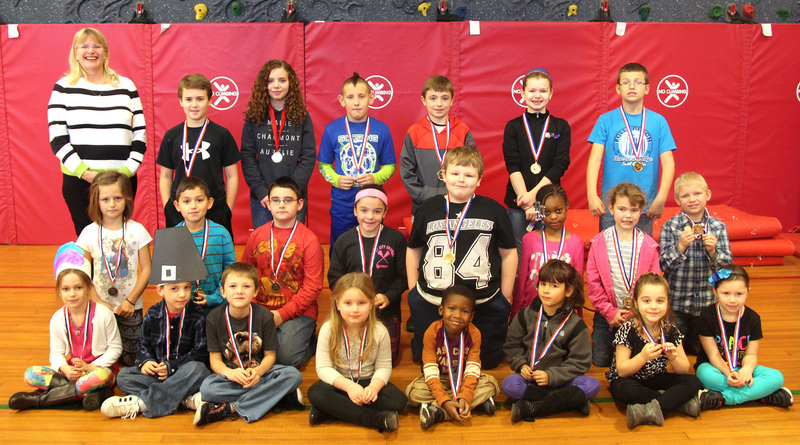 Their classmates cheered them on as Principal Ciesla gave each honoree a medal and a “brag tag” to add to their collection. Pictured in the front row, from left are: Kayla Pero, Dylan Mann, Landon Gibson, MacKenzie Schopp, Jaleel Barnwell, Alea Runge, Kameryn Marcellus, and Andie Kerr. In the middle row, from left are: Gabrielle Mitchell, Dante Heaney, Trevor Chappell, Mya Carroll, Ernie Cross, Jada Barnwell, Sandra Wittmann and Dominic Harris. Pictured, from left in the back row are: William Patterson, Hannah Marvin, Royce Painter, Alexander Crisafulli, Alexandra Coakley and Isaiah Johnson. Absent from the photo are: Megan Gates, Douglas VanSanford and Jose Colon.